Just a little over a month. Thats whats left of the legislative calendar this year, IF Congress decides to stick with it and not stay longer to finish its work. 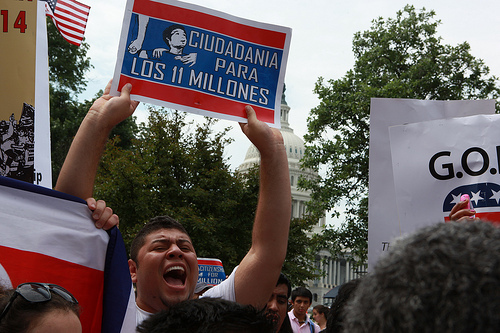 So what exactly does that mean for immigration reform? It depends who you talk with. Immigration activists channel the famous Yankees catcher Yogi Berra and say it aint over til its over, and theyre pushing for a vote in the House. While Congress is in session, there will always be the possibility of moving immigration reform forward. It is in the hands of those legislators who control the calendar. Its up to them to do it,” says Maribel Hastings, senior advisor at the immigration advocacy group America’s Voice. Community activists have been fanning out all across the country, lobbying lawmakers they consider to be amenable to holding a vote in the House. Upton said that there are many more Republican supporters of immigration reform than what many believe, adding that at least half of the GOPers in the House support it. The focus is indeed on the Republican side, with legislators weighing in and saying immigration reform is not a dead issue for them. Rep. David Valadao (R-Calif.) is one of several GOPers who have signed on to a comprehensive immigration reform bill recently introduced by House Democrats. Valadao signed on the H.R. 15, the Border Security, Economic Opportunity, and Immigration Modernization Act, which was introduced in early October by Florida Democrat Joe García, and is the only bill in the House that takes up the issue of immigration in a comprehensive manner, similar to the version passed by the Senate earlier this year. The White House says its definitely not giving up, and today President Obama met with business and community leaders to push legislators to take action. Just last week, we had 600 business and faith leaders who came to emphasize that this is something that is not only the right thing to do, but its also critical to our economy. We know that the Senate bipartisan bill that already passed would grow the economy by $1.4 trillion above and beyond the growth thats already taking place. We know it will reduce our deficit by $850 billion. This is not — these arent my estimates. These are independent estimates that had been made about the salutary effect that comprehensive immigration reform will have on our economy, Obama said. Meanwhile, theres a good chance that if the House does take up the issue, it wouldnt be as one package like the Senate did. Chicago Democrat Luis Gutiérrez — one of immigration reforms most ardent supporters in Congress — says could be taken up little by little. Not the ideal way, he says, but it is an option rather than see the entire legislation die on the vine. He would support it as long as, in the end, a comprehensive bill moves forward. There are many parts, many interacting parts. If you come over to my house and I gave you coffee at 9 and eggs at 10, you would tell me you should have given it to me all at once, but in the end its a full menu, he said on Chicago Public Radio. So the scramble is ON.